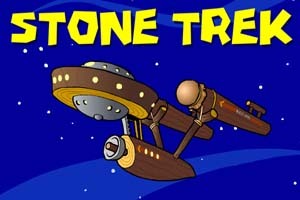 Stone Trek is a Comedy version of Star Trek done in the Style of the Flintstones, but not a crossover as there are no characters or storylines taken from the Flintstones. It is both original and refreshing and manages to keep the spirit of both shows more or less intact. The following episodes still appear on the above website, but the links below do not appear to work... and then I tried them again, and they did work... I don't know... The website above does work... usually. A more recent version on You Tube (posted April 19, 2017.) https://www.youtube.com/watch?v=Em-M0MOWx-A(3:45). 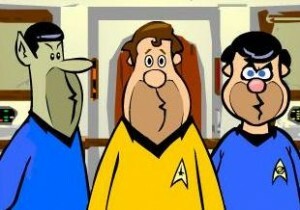 There is a list of many more episodes on this website, but they were never made. I read a comment by the creator that he does not intend to produce more of these. 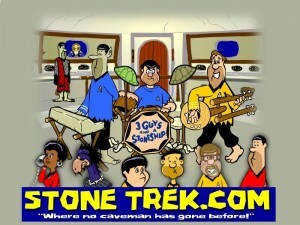 March 1, 2013, Brian Matthews posted at the Phase II forums that he hopes to create a second season of Stone Trek. I'll be looking forward to it!